The Antennae Galaxies (also known as NGC 4038 and 4039) are a pair of distorted colliding spiral galaxies about 70 million light-years away, in the constellation of Corvus (The Crow). This view combines ALMA observations, made in two different wavelength ranges during the observatory’s early testing phase, with visible-light observations from the NASA/ESA Hubble Space Telescope. The Hubble image is the sharpest view of this object ever taken and serves as the ultimate benchmark in terms of resolution. ALMA observes at much longer wavelengths which makes it much harder to obtain comparably sharp images. However, when the full ALMA array is completed its vision will be up to ten times sharper than Hubble. Most of the ALMA test observations used to create this image were made using only twelve antennas working together — far fewer than will be used for the first science observations — and much closer together as well. Both of these factors make the new image just a taster of what is to come. As the observatory grows, the sharpness, speed, and quality of its observations will increase dramatically as more antennas become available and the array grows in size. 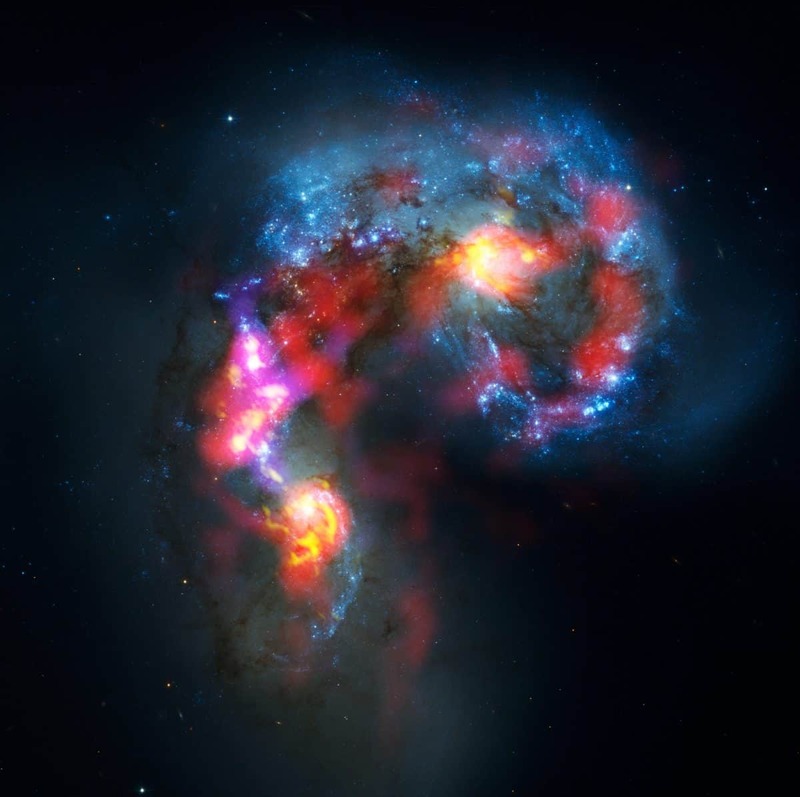 This is nevertheless the best submillimetre-wavelength image ever taken of the Antennae Galaxies and opens a new window on the submillimetre Universe. While visible light — shown here mainly in blue — reveals the newborn stars in the galaxies, ALMA’s view shows us something that cannot be seen at those wavelengths: the clouds of dense cold gas from which new stars form. The ALMA observations — shown here in red, pink and yellow — were made at specific wavelengths of millimetre and submillimetre light (ALMA bands 3 and 7), tuned to detect carbon monoxide molecules in the otherwise invisible hydrogen clouds, where new stars are forming. Massive concentrations of gas are found not only in the hearts of the two galaxies but also in the chaotic region where they are colliding. Here, the total amount of gas is billions of times the mass of the Sun — a rich reservoir of material for future generations of stars. Observations like these will be vital in helping us understand how galaxy collisions can trigger the birth of new stars. This is just one example of how ALMA reveals parts of the Universe that cannot be seen with visible-light and infrared telescopes.